I take client service very seriously. So does my team. Together, we are committed to providing an exceptional experience to all of our clients. Andi joined Anthony's team in 2015. Originally from California, where she worked with Northwestern Mutual Irvine since 2006, Andi brings a broad spectrum of experience to the team. Her primary objective is providing excellent customer service. Andi attended Iowa State University with a major in Communications. A huge fan of Anaheim Ducks hockey, in her spare time she enjoys cooking, fishing, playing poker, and reading more books than her Kindle can hold. She lives in Georgia with 3 cats and a dog, and is passionate about volunteering in her community and at the American Legion Post 106. Licenses: Series 6, Series 63, Tennessee and Georgia Life, Health, Variable and Long Term Care Insurance Licenses. How can Andi serve you? Alex has been with Northwestern Mutual since January 2014 and joined Anthony's team in 2018. Born and raised in Kingsport, Tennessee, Alex earned his bachelor’s degree in Business Management at The University of Tennessee at Chattanooga in 2013. While at UTC, Alex was a 4-year letter-winner for the Men’s Golf team. In his spare time, he enjoys playing golf, attending UTC sporting events and spending time with friends and family. He is involved with Big Brothers Big Sisters of Chattanooga and a member of the Mocs Club and C Club organizations. Licenses: Series 6, Series 63, Tennessee, Georgia, and Virginia Life, Health, Variable and Long Term Care Insurance Licenses. How can Alex serve you? Amanda joined Anthony's team in 2017. Born and raised in Chattanooga, Tennessee, Amanda earned her bachelor’s degree in Communications with a minor in Speech at The University of Tennessee at Chattanooga in 2015. Amanda is a huge fan of UNC basketball. In her spare time she enjoys photography, taking spontaneous trips, fishing, and spending time with friends and family. Licenses: Tennessee Life and Health insurance license. How can Amanda serve you? 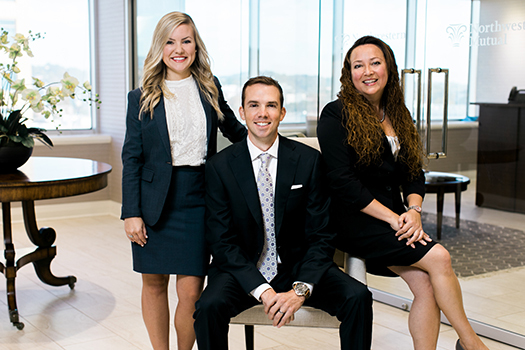 Anthony David Bussey uses The Bussey Financial Group as a marketing name for doing business as representatives of Northwestern Mutual. The Bussey Financial Group is not a registered investment adviser, broker-dealer, insurance agency or federal savings bank. Northwestern Mutual is the marketing name for The Northwestern Mutual Life Insurance Company, Milwaukee, WI (NM) (life and disability insurance, annuities, and life insurance with long-term care benefits) and its subsidiaries. Anthony David Bussey is an Insurance Agent of NM and Northwestern Long Term Care Insurance Company, Milwaukee, WI, (long-term care insurance) a subsidiary of NM and a Registered Representative of Northwestern Mutual Investment Services, LLC (NMIS) (securities), a subsidiary of NM, broker-dealer, registered investment adviser and member FINRA (www.finra.org) and SIPC (www.sipc.org). Anthony David Bussey is primarily licensed in Tennessee and may be licensed in other states.